Oh, man. What can I say about Why We Read? This book was such a labor of love. It occurred to me and my then-boyfriend, now-love slave (okay, husband) that we really needed to write a book together. But what could a nonfiction-reading Classics professor (him, in case you're not sure) and a fiction-loving s'mores enthusiast (that would be me) possibly write about? Why, books, of course, the very things that had brought us together. The result was this lovely little book analyzing the bestsellers of 1991 to 2006. We came, we read, we snarked, and mainly we wondered WHY THE HECK we had decided to write a book that required us to read tens of thousands of some of the awfulest pages ever written. But seriously, it was quite the experience, once-in-a-lifetime type stuff. You should be hearing the opening strains of "I've Had the Time of My Life" right about now. We American readers have a lot of dirty little secrets--and our bestselling books are spilling them all. We have bought millions of books about cheese. We can't resist conspiratorial crooks or the number 7. We want to believe our spouses are aliens. And over a million of us read 50-100 nearly identical books every single year. American reading habits speak volumes about our quirks--but even more about our desires and fears. 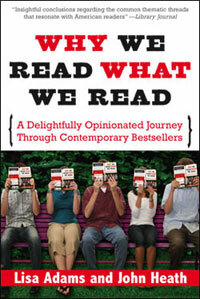 In Why We Read What We Read: A Delightfully Opinionated Journey Through Contemporary Bestsellers, Lisa Adams and John Heath take a snappy tour through nearly 200 of the bestselling books to hit the shelves since 1990, hauling out their persistent themes and noodling into the American psyche. What do readers want from their love lives? Who's got the greatest grip on God? Is everybody in Washington crazy--and nasty? Is there more to life than Chicken Soup? Immersing themselves in the mega-selling worlds of Nora Roberts, J.K. Rowling, Dan Brown, Nicholas Sparks, Bill O'Reilly, John Grisham, John Grey, Spencer Johnson, Rick Warren, and hundreds of other authors, Adams and Heath demonstrate that top-selling books are not merely flukes, not merely predictable favorites from a handful of genre masters. Rather, their common themes stretch across genres, satisfying a reading public scouring the bookshelves for comfort and encouragement from these disparate (and perhaps unlikely) gurus. That's all well and good--if a bit repetitive--but it turns out that most of these favorite books do exactly the opposite of what readers say they want. Ferreting out the appeal of these titles, Adams and Heath demonstrate how many inspirational books obstruct change, romances keep readers lonely, thrillers comfort, and political books undermine democratic values. They also explore those bestsellers, springing up from the oddest places at times, that bare human experience in all its messy, complicated, shades-of-gray splendor and thus give readers a more realistic shot at the growth and answers they seek. The first book to examine bestsellers from a reader's perspective--and perhaps the first entertaining book about bestsellers ever written--Why We Read What We Read is an incisive and eye-opening journey through American culture and all its angst and anxieties, obsessions and dreams. The 2007 annual bestseller lists are here! I swear I didn’t cut him into tiny pieces and bury him in the basement.